FB ad round-up – Did we finally hit a winner? You’ll probably notice that I’ve changed my blog’s appearance. I received a few comments that it was hard to read before with the light text on the dark background. I have to admit the old color scheme wasn’t my favorite either. So I hope this new look is easier on the eyes. I’d love to take a poll and know what you guys think, but I haven’t learned how to do that yet. But I’ll keep trying and get a poll in here sooner or later. 34 people! That’s the most clicks I’ve had in a six hour time frame by far and the highest CTR % (click through rate) of any ad I’ve done so far. So, I think we’ve hit on something here. But if I have, how can I leverage it? Marketers also talk about revolving an entire campaign around one message. Don’t confuse people with several messages, just deliver one and repeat it over, and over and over. If the numbers for this ad keep going like this, I may have just found the one message that finally fits. After the conference, I’m headed to the nearby Hastings in Denton, Texas for a signing from 6pm-8pm. 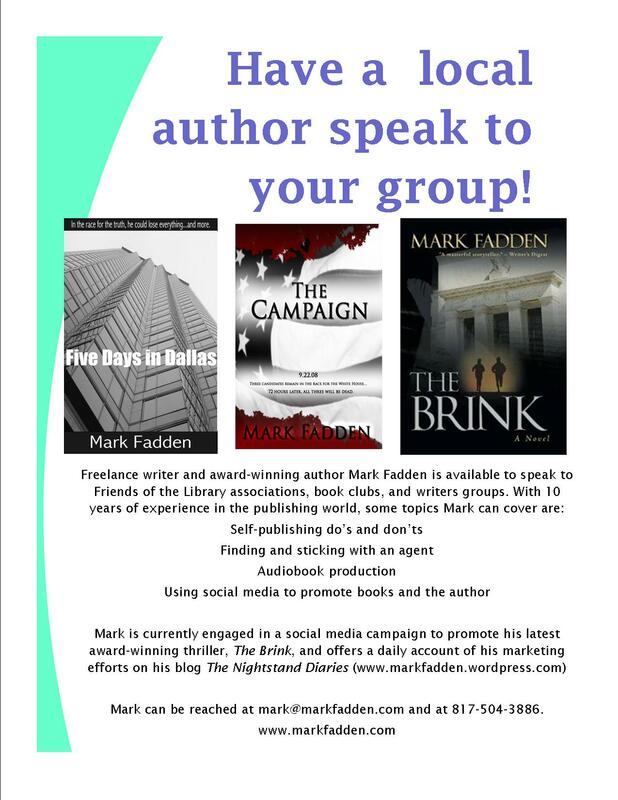 While I performed my normal promotional duties of sending all the local press a news release, I also talked to the City of Denton director of library services about inviting their Friends group to the signing. I am offering them the same deal I did for FCPL: all profits from books they buy during the signing will go to their Friends group. Bottom line is this: people that get involved in Friends of library groups love book and love their communities. If you’re a local author and do something nice for them, they will talk about what you did and your book to their friends and neighbors. You get that many more possible buyers that otherwise may have never heard of you. Einstein may have said that there’s no force in the universe like compound interest, but there’s no force in marketing like word of mouth.